Powder skiing on Jim Hill Mountain in late April. Attractions. These are two good backcountry skiing (or snowshoeing) peaks near Stevens Pass that can be climbed from the same entry point. Do either of these peaks as a medium-length day– or bag them both for a longer adventure. Jim Hill has a fabulous north-facing alpine bowl and timberline glades to ski as well as open clearcuts down low. Arrowhead has slightly steeper terrain with very nice glade skiing and tree skiing (old-growth hemlock forests) up high and open clearcuts to ski down low. Season. Being near (a bit east) of the Cascade Crest, the area receives lots of snow — especially up high. For an area with such easy access, these peaks are frequently some of the earlier ones offering skiing in December. They are also some of the later ones with quality skiing into May. The start is fairly low (2900 feet) so in early and late season you may need to walk a bit to reach snowline. Skill: Jim Hill: 2+ (advanced intermediate). Jim Hill: 3 (advanced). The descent of Arrowhead is a bit steeper than the point most people ski into the Jim Hill bowl. If no one has been in before you and you’re navigating on your own, the navigation is a bit tricky with both peaks — it’s easy to hit areas where the vegetation is thick or the pitch is quite steep. Our map shows good routes through the terrain (much of this comes from skiing the area with a GPS). Fitness: 2 (intermediate) to ski either peak individually; 2+ or 3- (strong intermediate to advanced) to ski both peaks in a day. Access. There are two access points for Jim Hill: 1) The Lanham Lake Trail from the Stevens Pass Nordic Area 2) the Henry Creek area. Lanham Lake access. Drive 29 miles west of Leavenworth, turn left at milepost 70.3, and follow the Upper Mill Cut from your portion of the divided highway to the entrance of the Stevens Pass Nordic Area. If coming from Stevens Pass, drive 5.75 miles east of the pass and turn right into the Nordic Area (elevation 2,980’). Henry Creek access. Many skiers used to ski/snowshoe both Jim Hill and Arrowhead mountains from the road near the bottom of Henry Creek (Milepost 71.2). A plow turnaround and parking for railroad employees working at the ventilator facility (East Portal of the railroad tunnel) is located just west of this road located at Milepost 71.1. Skiers and snowshoers used to park here and walk down the highway (or ski along the south side of the highway) to the Henry Creek Road (Spur Road 687). In 2007, many of the parking stalls were signed ‘No Parking’ to general recreationalists and this was enforced. More about the original closure here. As of 2014, there was space for a number of cars to park uphill (west) of the East Portal road in a plowed pullout (please park efficiently to maximize space for other skiers). There was also parking another 100 to 150 yards west of the pullouts mentioned above by turning off the highway on a dirt road leaving from the north side of the highway. These parking options are not designated winter recreation pullouts — you can use them if they are not signed ‘No Parking’, but you do so at your own risk — especially if it’s snowing and plowing is taking place. Stay out of anything signed ‘No Parking’ — it will be enforced. Wherever you park will entail a short walk downhill along the highway to the road where the tour starts — walk or ski along the south side of the highway. Accessing Jim Hill Mountain from the Henry Creek drainage. Parking at the Nordic Area. No permit is needed to park here. Snowshoers and skiers who are not using the groomed trails should park in the outer parking lot (closest to the highway and farthest from the groomed trails). Please ski up the summer trail to Lanham Lake and not up the black-diamond Switchback Trail which may have Nordic skiers coming down at fast speeds and with marginal control. Also, if you’ll be leaving your car overnight, check in at the lodge with the employees (leave a note at the lodge if no employees are present). This is to keep the Ski Patrol from mounting a search for a Nordic skier who, they think, might be lost (this has happened several times). 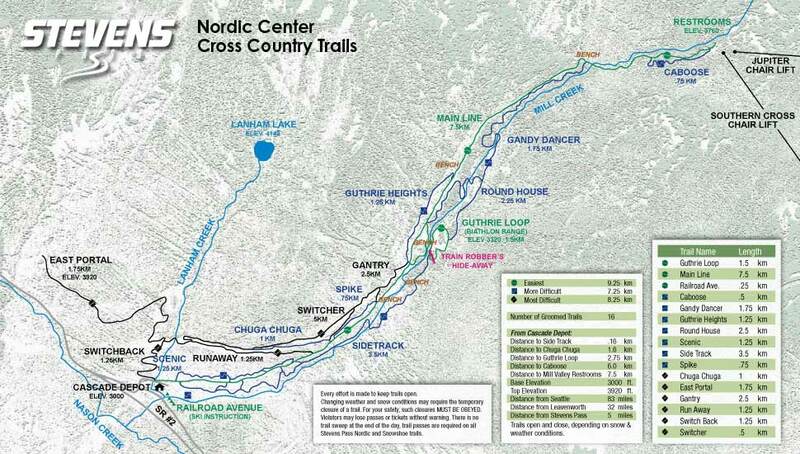 The Nordic Trail System. The skeleton of the groomed Nordic trails is formed by a series of old roads that lead from Highway 2 up to the lifts on the backside of the Stevens Pass Ski Resort (at the bottom of the Jupiter and Southern Cross chairs). Various loops are formed by connectors between several parallel roads. In total, the system has roughly 25 kilometers of trails. 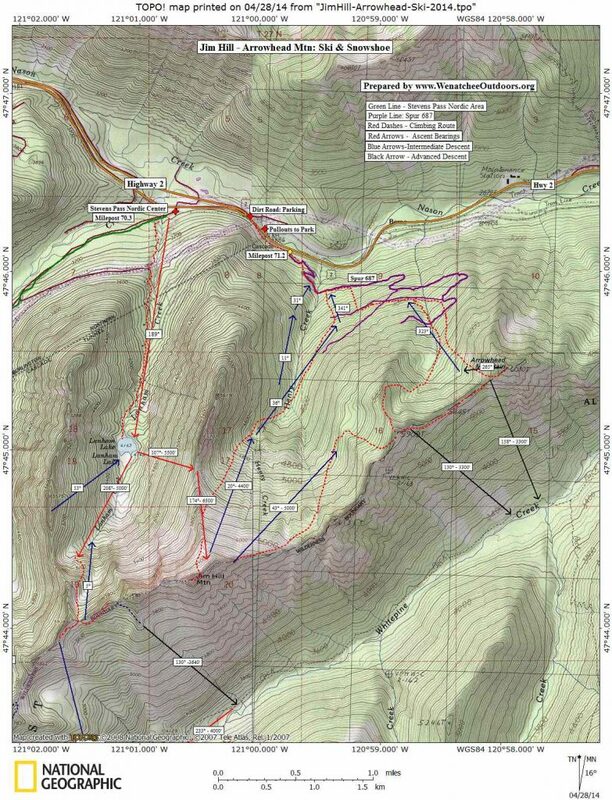 See a schematic map of the trails (supplied courtesy of Stevens Pass). Snowshoeing. Snowshoes can be rented at the Cascade Depot (the lodge at the base of the Nordic trail system. Lanham Lake Trail. The trail to Lanham Lake can be snowshoed or skied. Find it by walking onto the first leg of the groomed Nordic Trails and immediately turning left rather than following the skiers who will be turning right and skiing uphill. In 30 or 40 feet, look for the trail heading uphill in the woods. The trail parallels the ski trail for about 75 yards, then hooks left and heads directly uphill. Generally speaking, this trail heads south and stays on the west side of Lanham Creek. It’s about 1.75 miles to Lanham Lake (elevation 4,143’). Jim Hill Mountain via Lanham Lake. Immediately before Lanham Lake, skiers and snowshoers can switchback up a steep, west-facing avalanche slope and then enter heavy wood to reach a 5,500-foot gap in the north ridge of Jim Hill’s false summit. From the gap in this ridge, follow the ridge uphill toward the false summit, staying on or slightly to the side of the ridge crest. If you want to climb to the true summit of Jim Hill, ski to the 6,200-foot level along the false summit’s north ridge; then move off the ridge by fading climber’s right and climb the steep northwest-facing slopes leading to the notch between the false and true summit (6,640 feet). Leave the skis at the notch and boot the final short pitch to the summit (6,765 feet). Photo: De-skinning on the ridge above Jim Hill’s powder bowl. Many skiers forgo the true summit (steeper and trickier) and, at about the 6400-foot level, concentrate on the skiing prize: the big north-facing bowl. Ski the bowl until the vegetation thickens then climb back over the notch and descend to Lanham Lake. Or ski out Henry Creek. If you ski out Henry Creek don’t get sucked down near the creek bottom (thick and unpleasant vegetation). Stay well out of the bottom on either the west or east side of the creek. 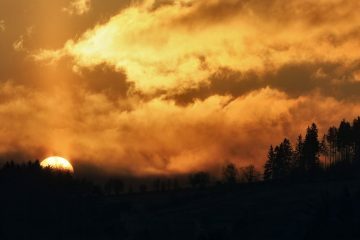 Jim Hill via Henry Creek. Many skiers also approach Jim Hill from the north via Henry Creek. Quite a bit of logging has taken place in the area since 2010 and there are a variety of ways to ski the area but here’s one good way. Follow the road a few hundred yards and cut the first switchs. Get back on the road and use it to come across Henry Creek. Shortly after crossing the creek, work up open clear cuts to about the 3,600 foot level and then make a climbing contour through the woods toward the creek. Hit the creek between the 3900-foot and 4,000-foot level and cross it. Now work up steep avalanche slopes that are initially north and then west of the creek. 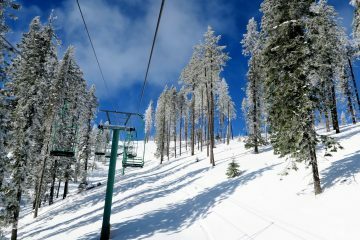 At about the 5,200-foot level, the trees open up more and you can decide how you want to ski up the big bowl ahead of you. Arrowhead Mountain. To ski Arrowhead after skiing Jim Hill, contour below the East Ridge of Jim Hill and then ski down and in a northeasterly direction to the 4900-foot level, Skin up and then contour north for a quarter mile before climbing east to reach the top of Peak 5,909. Now follow the northeasterly ridge leading over to Arrowhead Mountain. To ascend Arrowhead directly from the Henry Creek access, cross Henry Creek down low as described in the Jim Hill Mountain description and follow the road taking you across the creek for about a third of a mile past the creek. Then, facing south, work up clearcuts for 400 vertical feet. When you intersect the next logging road, turn left and follow the road for slightly more than a third or a mile. Two hundred yards before the road crosses the next creek east of Henry Creek, climb upward through the woods keeping the creek to your left for about 500 vertical feet. Up higher just maintain a bearing as you climb of about 243 degrees (true) and this will take you directly up to the southwest ridge of the peak. Upon reaching the ridgeline, follow it to the summit. Photo: Harvesting nice turns while descending Arrowhead Mountain. Not bad skiing for the last weekend in April. Snowmobiling. During the winter, the Stevens Pass Nordic Trails are closed to snowmobile use. Each year on April 16, however, Stevens Pass’ commercial permit expires and the parking lot and trails open up to snowmobile use. The scene here becomes quite different after that date. Leave It Better Than You found It. This should be every user’s goal. Don’t leave any trash and pick up litter found along the way.